Real estate news that's not only odd, but also real. What do God, ancient Chinese philosophy, psychics, witchcraft and Saint Joseph all have in common? These are the new tools in the real estate agent tool bag. Apparently some agents are willing to blame their unsold listings on “bad energy” and are using mystical techniques to get rid of all that negative energy to bring more ying & yang balance into their listing. While other agents don’t believe it will work, they also believe it couldn’t do any harm and are desperate enough to try it. An ancient Chinese philosophy that uses the laws of Heaven and Earth to help improve live by bringing positive Qi. To achieve this balance, you must bring in a Feng Shui expert to consult with about home colors, decorations, arrangement and other various methods of harmonious staging. Those who believe in Feng Shui will run away from a house that has a Feng Shui imbalance achieving negative Qi. Houses can also contain harmful energies, noxious energies, electro-magnetic fields, and psychic sickness. Who’d want to buy a house containing all those bad energies? Psychics can cleanse these bad energies and create a positive spiritual place that will sell. Don’t know how psychics can fix my EMF emitting toaster but who am I to question the supernatural. Apparently Wiccan chants and Pegan blessings sell houses. Who knew? You can find spells, chants, oils, spells, incense, and lots of other things to make your home sell. Of course if it doesn’t sell, you could always pull out that voodoo doll of your Realtor and stick a pin in it’s neck. Bet she’d return your call then. House blessings are a tradition in my church that goes back hundreds of years. It’s not as popular today as it was many years ago, but it was customary to have your house blessed when you first moved in. Now that the real estate market has tanked, many are exploiting God’s blessing for monetary gain by blessing the house to make it sell. Bet it would sell better if you tithed the proceeds. 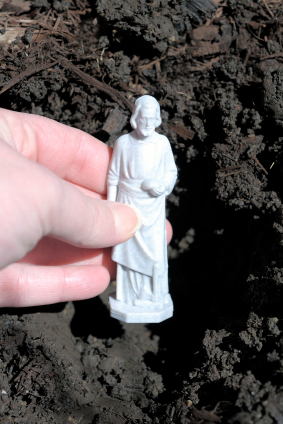 A common practice of real estate agents is to bury a statue of Saint Joseph in your yard, head down, facing the direction you want to relocate. Legend has it, if you do this then your house will sell more quickly. It works best when placed near the for sale sign. After the house sells, dig up the statue and place it on your mantle as a way of saying thanks. In case you were wondering, Saint Joseph is the patron saint of real estate. No one likes to see an alter with a bloody sacrificial animal carcass rotting on it during an open house tour. This practice is not widely received by the real estate community so do not sacrifice a chicken to promote your next open house. Incense is best left outside. The smoke is oily-thick and it coats the walls. The putrid smells last for weeks. There’s an old rule of real estate that says it’s hard to see the benefits of a house when you’re gagging, choking and your eyes are tearing up. Also incense burnings right before an open house could get out of hand and form thick cloudy smoke that lingers in the house creating a dense fog. Incense burnings should be left to the experts. So which practice works better? It would be interesting to have a home-selling competition between God, Chinese philosophers, Psychics, Wiccans, Pegans, and St. Joseph. Who do you think could sell a house quicker and for more money? This entry was posted in Funny Stories and tagged feng shui, god, listing, real estate, st joseph statue, witchcraft by Bill Petrey, Realtor. Bookmark the permalink. Bill Petrey, the CEO and Founder of AgentHarvest, has been written about in the Los Angeles Times, Inman News, AOL Real Estate, and Inman Next, among others. He founded AgentHarvest for the sole purpose of making the process of finding a good Realtor better and easier. Bill Petrey is an author and editor of both The AgentHarvest Blog, Real Examples of Really Rotten Realty Blog, and the creator of Really Rotten Realty. By the way, while researching this article I found psychics that can improve web site performance too. Guess psychics are getting into the Search Engine Optimization (SEO) market. If my website’s stats shoot through the roof in popularity during the next few months, you’ll know why. Bet I could make some money selling real estate agent voodoo dolls. While these “kookie” ideas can all look the same, I think feng shui has some value. If you follow the principles you will almost certainly have an attractive looking house with harmonious colors and layout. And most importantly not a lot of clutter. Is feng shui the only way to attain this peaceful, pleasant atmosphere? Absolutely not! Yes spiritual sales support has flourished into quite a sizable industry. However, if you’ve ever smelled incense, I can’t imagine having that smell lingering in my house. I promise, it smells nothing like flowers, fresh bread, cookies or any other sensory techniques agents use in open houses. Some people do really believe in this kind of stuff,, they are sometimes so hell bent on such stuff that it starts to get on my nerves,, my uncle is a feng shui freak,, all the furniture and every thing has to be according to feng shui.. but i guess everyone has the right to live their lives the way they want!! Does it bring your uncle peace of mind and contentment or is he so obsessed with it that it actually brings stress and discomfort? Yes, my Mom was a big proponent of the St. Joseph statue. I’ve seen them available in many gift shops with a little card inserted, telling you how to bury him to ensure a quick sale. Yes, agreed. Animal sacrifices may be taking it a bit far. While all those examples are supernatural beliefs, some people really believe in this. My own beliefs are that a prayer is enough and a house blessing before staying in it bring good luck. Yes, but some houses require more prayer to sell than others. Who believes this? Who believes this? Really how insane do you have to be. I understand the effects of interior design on your emotions and state of mind. But this is a set of strict rules that conflicts with your tastes. I think for example its a bit strange to have a musical instrument and a tiny painting as the first thing you see. It’s steeped in Chinese culture and their beliefs. I don’t understand it, and I wonder how much of it Feng Shui designers make up to jack up the costs, but if someone believes in Feng Shui and wants to buy a house that is Feng Shui’ed (probably made that conjugation up but bear with me) then it could be argued that Feng Shui works if it’s a desired feature. Who believes this stuff? Californians.